Anne Stokes is renowned worldwide for her breathtakingly beautiful fantasy artwork. 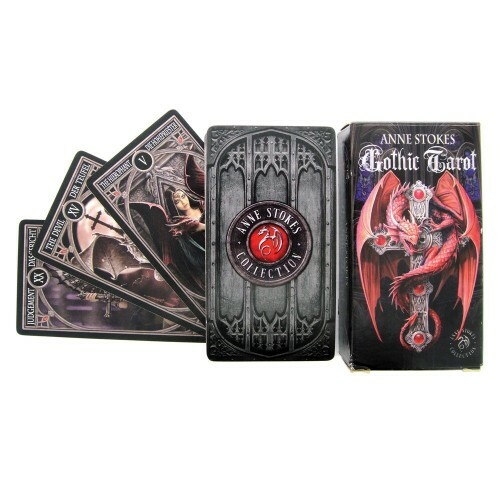 Gothic Tarot is a 78-card deck. 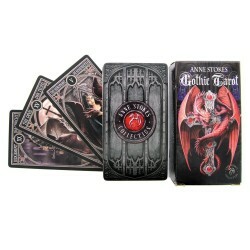 The cards are filled with a dark fantasy mix of dragons, unicorns, skulls, vampires and bats. The wands are themed to mighty dragons. Cunning vampires have replaced the cups. Skeletons stand in for pentacles, and the swords have become angels. Boxed deck. Cards measure 2.5 inches x 4.5 inches and includes 78 full-colour cards and instruction booklet(in English, Spanish, French and Portuguese).